Hard Anodized GrillGrates can tolerate high grill heat up to temperatures of 900℉, and are easily cleaned using a traditional grill brush or our new GrateBrush. Hard anodizing creates an ultra-hard and dense surface layer that can not be easily scratched or chipped off. This hardness helps to prevent food and grilling debris from sticking. 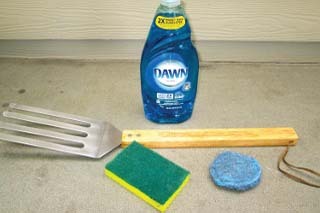 Replace your grill brush often! 3-4 times a year if you grill regularly. 1. 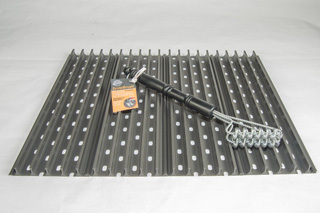 Clean Raised Rails using a grill pad or brush. Less is more. The raised rails easily wipe clean during warm-up or when brushed hot with a bit of water sprayed on the grill. 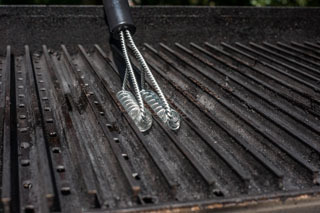 TIP: break-in the hard anodized GrillGrates by cleaning them as little as possible when they are new. Avoid cleaning in the sink in the beginning as you want to encourage the seasoning process like a cast iron skillet. 2. Allow the sides of the rails and valleys to blacken for maximum seasoning and minimum cleaning. Just keep debris out of the valleys and wipe down the raised rails during warm-up. Periodically use the GrateTool to shovel debris from the valleys. For those of you using GrillGrates as a replacement, scrape the debris to the back of your grill and shovel it out with the GrateTool. Periodically remove debris by lifting the GrillGrates out of your grill and depositing into the trash. You can also use a shop vac to avoid having to remove the GrillGrates from your grill. High heat burn off in unnecessary. When you are finished grilling, just shut down the grill. It is easier to clean during the next warm up. Pro Tip: Try running your set of GrillGrates with a couple of them flipped over, rails down. The benefits are two-fold: you’ll have an area on your grill that can be used as a griddle AND by getting in the habit of occasionally rotating the grates they will essentially self-clean. Do not put anything on top of your GrillGrates other than food or our GrateGriddle. 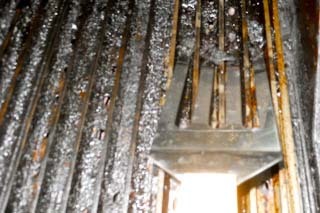 Heat can potentially become trapped and damage the GrillGrates. 1. Preheat Grill with GrillGrates in place. Make sure GrillGrates are interlocked and facing you. Place GrillGrates on charcoal grills after coals have burned down. GrillGrates will make your grill run hotter so we recommend you start out with your burners turned down lower than you normally grill with. Keep the hood temperature below 700F. This avoids warping or burning your GrillGrates. The GrillGrate surface runs 150-300F hotter than the hood temperature reads! 2. 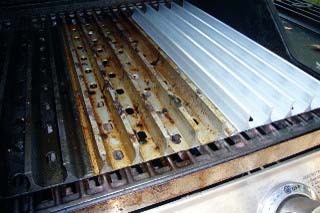 Initial Use: The first time or two you grill with GrillGrates hit the tops of the rails with a rag or paper towel that is wet with a bit of oil with a high smoke point such as refined peanut oil or avocado oil Discontinue use of oil once the grates are seasoned as continuous use can cause a build up and cause sticking. GrillGrates will season quickly and the non-stick develops naturally. Always oil your food before seasoning it and putting it on the grill. Hard Anodized GrillGrates can also be cleaned in the sink if you choose. 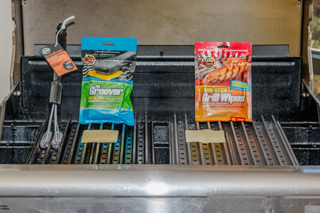 Sink cleaning is optional, but effective, especially after marinades and sauces have burned and collected in the valleys, or after the GrillGrates have seen months of continuous use! Soak GrillGrates in the sink or washtub with regular dish soap or some Simple Green. 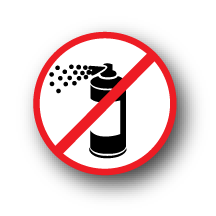 Do not use any harsh cleaners that would require you to wear gloves. The chemicals can potentially react with the aluminum and cause it to weaken. Use a sponge or brillo on the raised rails, which will come clean with little effort. 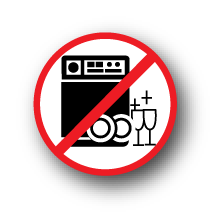 All other surfaces will blacken and become part of the seasoning so sink cleaning should be done only occasionally to preserve the seasoning.